What would it look like if artists could help to shape the distribution of philanthropic dollars? 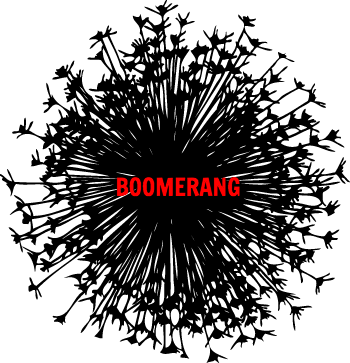 Announcing, Boomerang, our latest adventure in breaking open traditional forms of philanthropy through experimental grantmaking. As you may recall, this year is the Year of the Flow Fund at Kindle Project and our latest program is an extension of this obsession. Boomerang seeks to shed light upon and creatively catalyze unseen opportunities by widening who influences philanthropic resources. What unusual projects, creators and ideas would be supported if our grantees and awardees had input and leadership with funding decisions? How could being involved in grantmaking processes help to embolden the artists themselves? What ripple effect might all of this have? Step One: Scour the earth for new talent. Choose this year’s seven Makers Muse Artist Awardees (stay tuned for September when we’ll be announcing this year’s stellar group). Step Two: Flow Funds. Offer each of our seven outrageous and courageous artists a Flow Fund to recommend be reallocated to an organization or project of their choosing. Step Three: Conversations beyond money. Work with each artist to support them in the decision of who they will recommend. Our conversations will explore decision-making, power dynamics, project discovery and alignment in preparation for their Flow Fund recommendation. Step Four: Storytelling. Work with each artist to get their unique stories up on our Nexus page. Stories from the voices of the artists themselves about who they are, what their work means to them, and maybe even some creative curve balls thrown in for good measure. Step Five: See where all the ripples lead to. Who will our artists choose to recommend their Flow Funds to? What will the experience be like for the artists themselves and the new grantees that come from them? What can we bring back to the field of philanthropy after this experiment? Echoing the fluid and somewhat unpredictable movement of a boomerang, this program releases an opportunity, allowing unlikely and unusual partners and projects to return with unexpected, vibrant and tenacious outcomes for everyone involved. It’s an experiment that we’ve crafted with the care and engineering of a boomerang which we’re now tossing to the winds to chart a new course in grantmaking. Join us in the experiment and stay tuned for our artist announcement and their stories coming this fall.